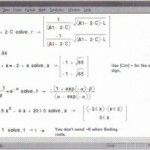 Elsewhere in this User’s Guide, you’ve seen Mathcad engaging in numerical mathematics. 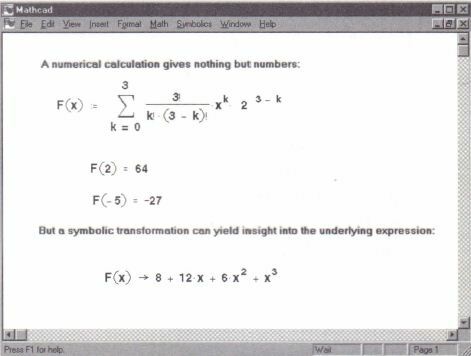 This means that whenever you evaluate an expression, Mathcad returns one or more numbers, as shown at the top of Figure 17-1. Although these numbers are quite useful, they may provide little insight into the underlying relationship between the components in an expression. 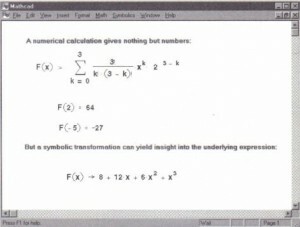 When Mathcad engages in symbolic mathematics, however, the result of evaluating an expression is generally another expression, as shown in the bottom of Figure 17-1. The form of this second expression is to a great extent under your control. 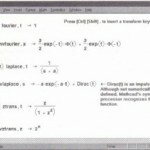 You can factor the original expression, integrate it, expand it into a series, and so on. The way you control the form of that second expression is the subject. There are three ways to perform a symbolic transformation on an expression . • You can use the symbolic equal sign as described in the section “Live symbolic evaluation”. This method feels very much as if you’re engaging in numerical math. • If you need more control over the symbolic transformation, you can use symbolic keywords with the symbolic equal sign, or you can use commands from the Symbolics menu. • You can make the numerical and symbolic processors work together; the latter simplifying an expression behind the scenes so that the former can work with it more efficiently. 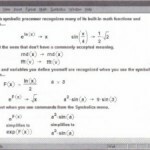 This is discussed in the section “Symbolic optimization” . Symbolic processing also raises some subtle issues concerning the use of functions and variables. 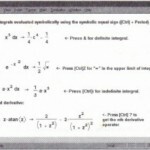 These are described in the section “Using functions and variables” . 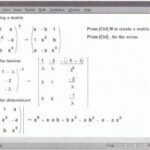 Finally, there are some fundamental inherent in computer based symbolic processing generally. These arise because nobody really knows how the human brain does symbolic processing. As a result, nobody really knows how to teach a computer to do it. 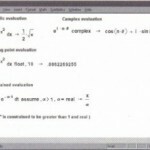 These limits are discussed in the section “Limits to symbolic processing”.